Monk describes her student life at Coastal and her early careers in Columbia, SC and Loris, SC. 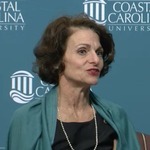 Her return to Coastal to lead the public information office experienced challenges of campus growth and expanded communications. Her memorable CCU news stories from early 1990s to 2015 are discussed. Monk, Anne Trainer and Tomczyk, Charmaine B., "Anne Trainer Monk, oral history interview" (2016). The Coastal Carolina University Oral History Project. 10.